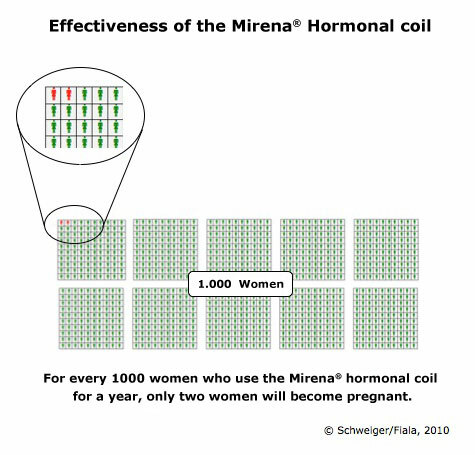 The Mirena® hormonal coil is one of the most reliable forms of contraception in existence. For every 1000 women who use the hormonal coil for a year, only two women will become pregnant. Only one other method has such a high level of reliability, and that’s sterilization. For every 1.000 women, who are sterilized, five women become pregnant in a year. For every 1.000 women, who use the copper coil for a year, eight women become pregnant. For every 1.000 women, who use the contraceptive pill for a year, 80 women become pregnant. For every 1.000 women/couples, who use the condoms as contraception for a year 150 women become pregnant. In Austria, there are currently around 200 000 women who have opted for the hormonal coil, which is about 10% of all women of child-bearing age. Some of them are on their second or third hormonal coil. Worldwide about 12 million women have tried the hormonal coil so far.